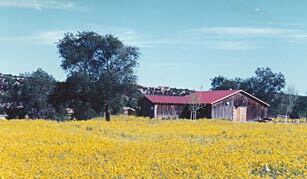 Many Santa Feans remember Frenchy’s Dairy Farm that occupied this site between Aqua Fria and the Santa Fe River. The owner Frenchy Parachou, who was actually Basque, left this 17-acre property to the City of Santa Fe to be used only as recreational open space. In this densely populated district, the neighbors wanted the new park to be nature-oriented passive recreation linked to the city’s open space network of trails and parks. Jemez and Sangre de Cristo mountains. dock, through rock outcroppings to the Santa Fe River. The entire site has been landscaped with native wild flowers, fruit trees and ornamental shade trees.